Places are limited so booking early is advised for the final conference of the LEXSHA European Project, taking place at University of Bordeaux, France on 25th November 2015. The conference will showcase the two years of work and development on the LEXSHA (Learn, EXplore & Share) Project which has involved over 100 small businesses from eight different countries. The result is the development of an innovative international sharing and network platform designed especially for smaller enterprises. Check it out onwww.lexsha.virtual-campus.eu. The conference has a very interesting programme which includes inspiring speakers and a visit to the University Institute of Technology. One of the keynote speakers is Gunilla Almgren – the President of the European Association of Craft, Small and Medium-sized Enterprises (UEAPME). UEAPME serves as the voice of small and medium enterprises throughout Europe. The Association’s presence is a strong endorsement of the level of interest that LEXSHA has generated and its potential. The UK will be well represented at the conference. Exponential Training’s Managing Director, John Moore, is one of the main speakers at the conference; John will be discussing the use of digital tools in vocational education and training and business support. In addition, two UK companies which took part in LEXSHA will be attending – both have been nominated for an award. You can either attend the LEXSHA European conference in person or join in by registering for the presentations which are being streamed online live direct from the conference, Register Today. This week I had the privilege of chatting to one of my boyhood heroes! 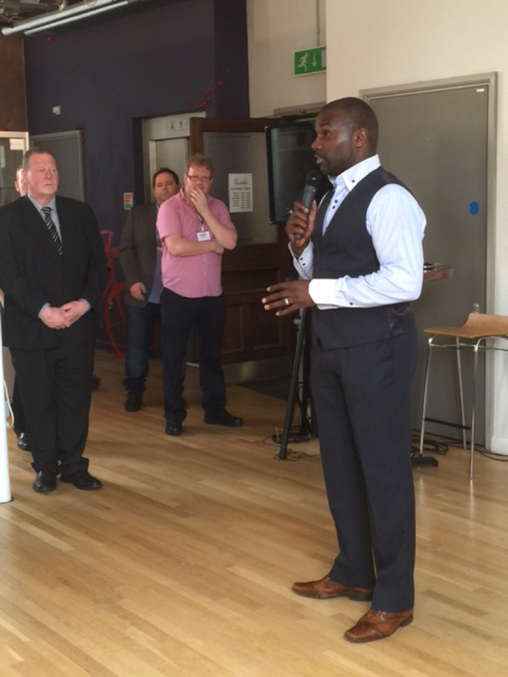 Derek Redmond a member of the 4 x 400 world championship relay squad along with Roger Black, John Regis and Kriss Akabusi. We concluded that time is fast running out for the traditional trainer. We talked about his amazing experience as a member of the GB team that shocked the Americans by changing the way to run a 4 x 400 metre final – I won’t share this with you here as he uses this story in his role as a motivational speaker. What I will share is that we agreed that employers need to re-think how they develop talent and performance within their organisations. The role of the traditional trainer is in rapid decline and employers need to wake up to this if they are to survive and thrive in the future. His key note talk certainly resonated with me and how Exponential Training has and is evolving our approach to helping managers and organisations to resolve problems and improve their performance. The focus of training for many employers is still knowledge and skills, what I call content driven training. The problem is content is available 24/7/365 to anyone who needs it – this means knowledge or content is available on demand and does not need to be provided in a formalised and structured format. The ‘spoon-feeding’ model of learning has never really been the most effective way of learning despite being the preferred model for most organisations and training and education providers. The knowledge-based trainer is living on borrowed time! I find it unbelievable that managers and organisations do not realise that they have a wealth of learning and development resources available for free right under their nose – the workplace. Research carried out by Lombardo & Eichinger over a decade ago suggests that lessons learned by successful and effective managers are roughly 70% from tough jobs and experience (i.e. doing), 20% from people (i.e. social learning), and 10% from courses and reading (e.g. formal learning) – what does 70:20:10 mean? It means every organisation is sat on a massive learning and development resource that they already own and have paid for through running their business. The challenge is how to capture it, access it, share it and exploit it. Projects like LEXSHA where entrepreneurs capture and share their experience with each other seek to do exactly this and is a model that businesses could do worse than replicate within their own organisation. Trainers will need to evolve or risk being left behind. It is a model that Exponential Training started to embrace over five years ago. With the advent of new social learning techniques, I predict that learning and performance improvements will be driven by more peer to peer support, collaborative learning and an increase in the use of creative social learning platforms. Learning and development professionals need to evolve or risk being left behind just like the US 4 x 400 relay team! Get involved in our International knowledge sharing platform! After a year of determination and hard work, the LEXSHA platform went live during the LEXSHA project meeting in Vilnius, LT last week. LEXSHA stands for Learning, Exploring, Sharing and represents an international platform for knowledge sharing and problem solving for owners and personnel of micro companies. BDF is looking for owners or employees of 10 small businesses from all over Europe to join the first LEXSHA Networking Group to be set up in The Netherlands. Interested in being among the first businesses to take part in LEXSHA? Read the entire article on our website or contact Erna van der Werff. On the 25th of November the final conference of the LEXSHA project will take place at the University of Bordeaux. After two years of international collaboration, the LEXSHA project has led to the development of an international sharing & network platform for very small enterprises. Check it out on www.lexsha.virtual-campus.eu. The conference has a very interesting programme which includes inspiring speakers and a visit at the University Institute of Technology. One of the speakers is Gunilla Almgren, president of the European Association of Craft, Small and Medium-sized Enterprises (UEAPME). This organisation serves as the voice of SMEs in Europe. Are you interested to come? BDF is happy to welcome you there! Download the invitation for the final conference here. After the fun and craziness of the Eurovision Song Contest 2015, which brings Europe’s nations together (congratulations to Sweden by the way), LEXSHA is now doing the same for European entrepreneurs. This month has seen the roll out of the new entrepreneur’s networking platform, LEXSHA, bringing small business owners together from France, Sweden, Portugal, The Netherlands, Greece, Lithuania and the UK. LEXSHA is an innovative, online portal connecting businesses who want to learn, explore and share practical ideas and experiences with likeminded businesses. As the UK partner, Exponential Training is coordinating a team of sixteen National Facilitators who in turn are working with 80+ businesses throughout Europe. LEXSHA is a European funded project designed to help small businesses to learn and share ideas and expertise with each other. LEXSHA is also the term used to describe a short, practical piece of knowledge or experience that an entrepreneur shares with other entrepreneurs. A LEXSHA can be prepared in any digital format such as a podcast or audio file, a short video, an e-book, a Word or PDF document, a checklist or even a mini case study. What is unique about LEXSHA is the content has not been produced by training schools or universities, but by entrepreneurs. This means that it is relevant, sensitive to the needs of smaller businesses and to the point. One UK business, Dreams of Chocolate, owned by partners Matt Andrews and Chris Ordish, is preparing a LEXSHA about organising an event. Among other things, Dreams of Chocolate supplies huge chocolate fountains for weddings and therefore making sure everything runs smoothly calls for meticulous planning. Chris’s LEXSHA will share his approach to planning – look out for the Dreams of Chocolate LEXSHA later this month. If you or your organisation has knowledge or expertise you think other business owners would benefit like-minded entrepreneurs, why not consider becoming a LEXSHA member. If you are interested and would like to find out more information please feel free to contact us. Becoming a member could not be simpler. The free online registration process just involves registering on the platform at http://lexsha.virtual-campus.eu. Once registered as a member you can access as many LEXSHAs as you want at no cost. You can also learn how to prepare digital content showcasing your knowledge, experience and expertise that can be uploaded and shared with other LEXSHA members.